Peace and quiet are the hallmarks of this home. Ancient farm of XVIII, forming a small hamlet that you are fully reserved. Recently restored, it offers an ideal location for 2 families or a family with older children. Open view on the valley of Laurence descending to Montignac (Lascaux). In the middle of 9 hectares of meadows and woods available to tenants, it enjoys tranquility. The heated pool (11 x 5 salt hydrolysis) is secure. Many terraces are output to all buildings; some are shaded by large trees. Many garden equipment (tables and chairs, armchairs, chairs, parasols, barbecue) are available. 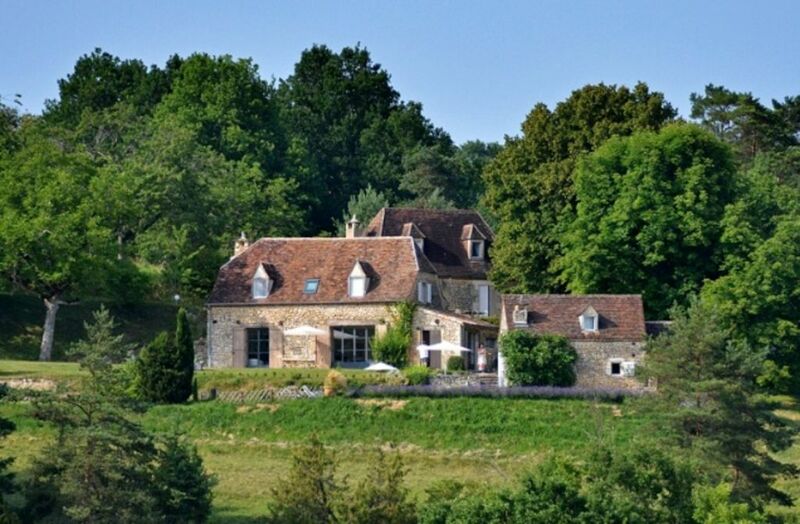 Located at the edge of the 'valley of man' and has been named the valley of the Vézère flowing nearby, Fontpoutreau offers a place of calm to address the famous sites of Périgord. the cave of LASCAUX is a few kilometers with the city of MONTIGNAC directly located on the Vézère; you will find the International Center of Parietal Art. The famous town of SARLAT is a little beyond 40 km and the many castles of the Dordogne valley are on your doorstep. Between Vézère and Dordogne, you can also choose between different sites or prehistoric caves with paintings. The National Museum of Prehistory is at your disposal EYZIES Tayac (30 km) to trace these main stages of the past. Two bathrooms and two bathrooms (large showers) are available in the main building. Another bathroom (power shower) is located in the annex. There are 4 toilets in all buildings. Sheets and towels are provided, as well as tea towels. Large double door refrigerator is available with a freezer compartment and an ice dispenser. A large stove top with 5 gas rings and a large electric oven. Many terraces are available, equipped with tables, chairs and garden chairs. they are either shaded (large trees) is largely sunny. One located at the pool level has sun loungers. The pool is treated by salt hydrolysis. The kitchen is equipped with a large format cooker with 5 burners (gas). Note for athletes of any level, a course 'acro-branches is in close proximity (1 km). The perfect French house for a large close family. Our third visit and the fourth already booked. This house still has the wow factor for our family; four children, partners and grandchildren 1-8yrs. Our youngest even flew from India for the week such is the bonding and banter value on offer, mainly thanks to the pool, a magnet for us all. The high spec bathrooms are another attraction. Although we came in 4 cars, as usual we did not venture far, relying on the more than adequate local Carrefour and weekly market in Thenon. A mass outing to the caves was attempted then aborted by the queue, but Decathlon in Perigieux is a popular alternative. We took 6 bikes, useful to buy bread and associated patisserie in the morning and to ride the circuit round the village through the wonderful countryside. The kitchen facilities with the stainless steel fittings are popular with us all as we take turns to cook fancy meals, some by BBQ, to impress siblings. Eating outside at night under the nicely lit trees is a treat. Not one mosquito was heard or felt. The living room is spacious, comfortable and perfect for board and card games with and without grandchildren. The sofa is refuge for sleepy children after lively pool activities. Mme. Labat welcomes us warmly on arrival and keeps the house immaculate. The house has incredible views from the top of the valley but the terrain is steep with steps crafted into the gardens. These were initially an obstacle to a 70 yr old with 2 new knees and an aversion to using sticks but did encourage independence and resourcefulness as nothing was going to prevent one being first in the pool. In short, this house is a quiet oasis, yet close to an autoroute and airports--Bordeaux, Brive and Bergerac. We drove there from London on one tank of diesel. As in previous years no one felt inclined to eat out as staying in tested everyone's culinary skills and a whole family meal is now a rare event; Carrefour did very well out of us that week. Amazing house in such tranquil surroundings. Beautifully decorated and fully equipped. We stayed here very comfortably for one week and there were six adults and five teenage kids. We didn't even use the Gite which could have slept four very comfortably. The house sits at the end of its own private track, with the most amazing views of the country side. Extremely peaceful setting but yet only 5 minutes in a car to the nearest shops. Also a great location to explore Montignac and Sarlat towns, trips on the river and caves were all near by. Towels and bedding were all very new and clean. Much thought has gone into this property to make your holiday very pleasant and comfortable. Highly recommend this house for families or friends to spend time together. The pool was a great plus point. We loved this beautiful farmhouse, the website photos look stunning and the reality is even better! The interior is beautifully designed and definitely has the “wow factor” as you walk in. The house is perfect for large groups of family or friends. We were 12 adults and found plenty of room for everyone to have their own space, and yet with dining and sitting areas able to accommodate the whole party, inside or outside. Everything is neat and clean on arrival, and the kitchen, bathrooms and other facilities all work well, especially the two new bathrooms and their attached bedrooms. Furnishings are comfortable, although the white coverings and linen might be challenging for those with young families! The house is well equipped with enough of everything to cater for 12 people, with the oven, fridge and dishwasher all up to the task. Outside, there is a variety of sitting places for sunshine and shade, the pool is lovely; very clean and with a “refreshing” temperature during our stay. The location is quiet and peaceful, and the views over the valley are lovely at all times of day, but most especially when helped by a glass or two of wine in the evening! Thenon is a nice village, with an excellent Carrefour – especially the butcher – and the nearby historic village of Ajat offers a wonderful Auberge for drinks or dinner. Further afield, Montignac’s Wednesday market is well worth a visit. The owner, who lives away, and his local representative were very friendly and helpful, and overall we would happily recommend Fontpoutreau as a great holiday location. Belle maison très spacieuse, amenagée avec goût et bien equipée dans un environnement beau et calme. Un grand pool securisé et un grand jardin bien entretenu. Le village avec des restos et des commerces n'est pas loin, idéalement placé entre sarlat et périgueux pour visiter chateaux, lascaux etc. Nous étions 7 amis et nous avons passé un excellent séjour. A conseiller vivement. Tarif pour une semaine de location, arrivée le samedi 16h et départ le samedi à 10h.